Before I delve into any specifics, I just have to say this: I love The X-Files (1993-2002). I still remember with crystal clarity—which is saying something, as my long-term memory is terrible—the first time I watched it, sat expectantly on the floor in front of the television in my parents’ living room, and that I loved every second in spite of those heightened expectations. This was via the original UK video releases complete with their evocative cover artwork and comparatively nondescript logo, and which, sadly and inexplicably, I never kept after upgrading my collection to DVD. The series remains a strong influence upon me, and, as I mentioned in my previous post to feature The X-Files, not least so as regards one of the key reasons I started this blog. I am beyond excited at the series’ upcoming revival for a short run of episodes in 2016, and will be doing my best to keep pace with the “201 Days of The X-Files” re-watch. 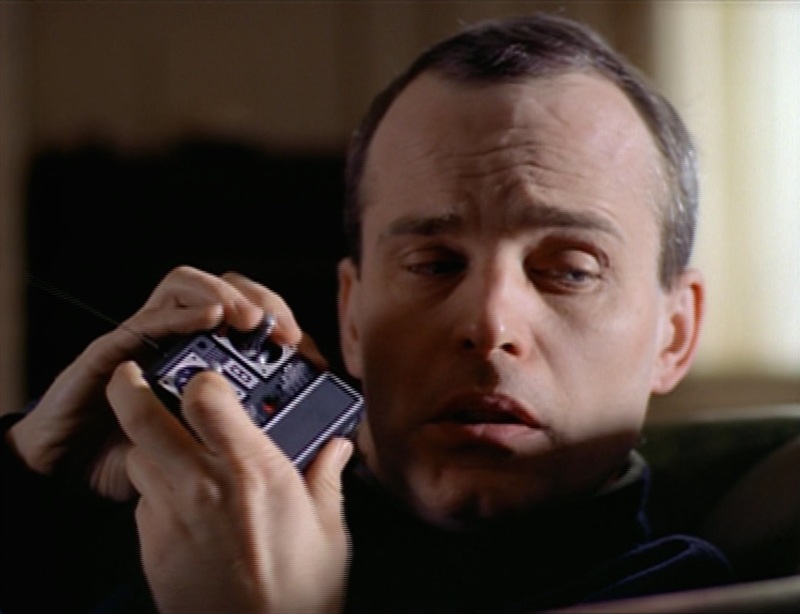 It is for that reason that I now return to the series here, and offer a few thoughts on the representation of autism offered in today’s instalment in that mammoth re-watch: “Roland”, the penultimate episode of The X-Files‘ first season. It is fair to note that it is not one of the most highly-regarded outings in the series’ first year, although it is certainly buoyed by a phenomenal guest performance by Zeljko Ivanek as the titular, occasionally-less-than-mild-mannered janitor at a research facility. This was noted at the time of its production, when director David Nutter sought to centre the episode upon the strength of that performance. Of Ivanek, he said, “when I knew I had him, I thought it was important to push that as much as possible, to help outweigh the frailties in the script”. He was the first actor to read for the part, and landed it immediately. He “just blew us away”, remarked series creator and executive producer Chris Carter in the official guide to the series. The actor himself recalls the audition, describing it as “one of the incredibly few times where I read something and thought, ‘That’s as good as I can do. '” He remains proud of the performance, adding, “It’s still on my demo reel, it’s still one of my favourite things”. Ivanek’s performance is undeniably a powerful and nuanced one, and the centrepiece of the episode. Special Agents Fox Mulder (David Duchovny) and Dana Scully (Gillian Anderson) meet Roland Fuller during the course of an investigation into the grisly murders of two propulsion engine scientists. As suspicions fall upon the unlikely figure of Fuller, long-hidden truths are ultimately uncovered to reveal that he is under the psychic control of the man who hired him: Dr. Arthur Grable, a scientist at the facility who died several months previously but whose consciousness survives in his cryogenically-frozen head. (Writing that sentence puts me in mind of a recent Darin Morgan podcast interview in which he stated that every X-Files concept sounds ridiculous when spoken out loud.) In a further twist, Grable and Fuller are revealed to be identical twins who were separated in childhood, a trauma that still haunts Roland. In spite of its context to frame the narrative, it is a welcome approach, and it is also complemented by Mark Snow‘s musical motif for the character, which he described as a “simple, very child-like, slightly forlorn, sad piece”. Yet is it possible here to read the implications from this exchange as being more sinister still? Whilst the implausible explanation for Roland’s behaviour is that he is being psychically controlled by the cryogenically-preserved head of his twin brother, I can’t help but be struck by the allusion that the violent outbursts of this mentally ill man are simply outwith his control. That may be an overstatement and an entirely unintended representation on the part of Ruppenthal’s script. 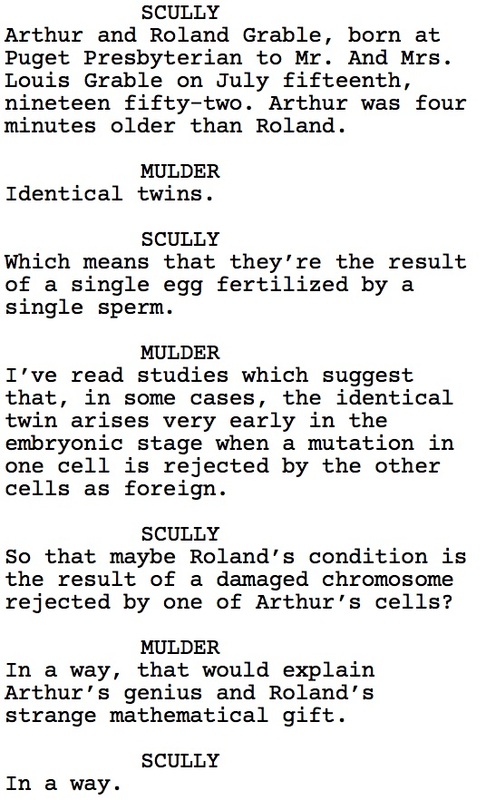 Perhaps the reveal of the X-File at the root of his behaviour is actually meant to subvert such an interpretation. Nonetheless, I find it unsettling. As I noted before in regards to The X-Files, anomalistic psychology can posit mental health and the paranormal as not unnatural bedfellows, when handled respectfully. Ultimately, “Roland” speaks to the potential power of an actor’s performance to help navigate that line with due care, even when the source material itself threatens to veer off course. And I was the girl who after an Autism Association ad came on after DeepQuestSV and therefore X-Files – ran away. Yes – twin inheritances and genetics and Roland. Endocrine stuff comes in as well. 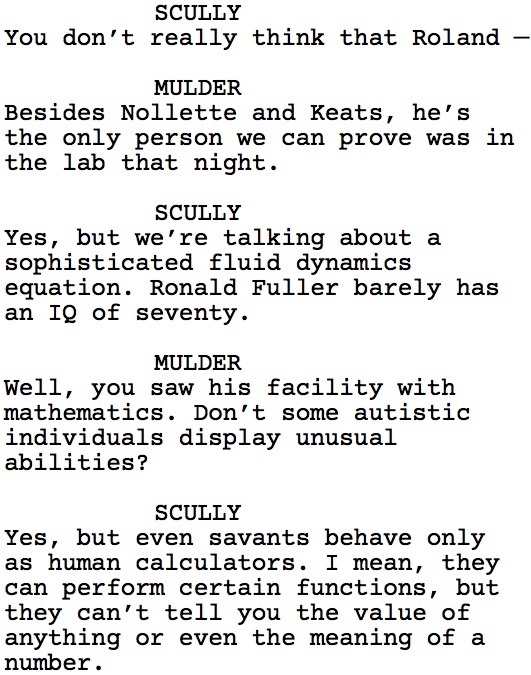 I thought some X-Files fans might well have read A CHILD OF ETERNITY where Adri raises this as a possibility for her autism. Thanks for the reply, Adelaide, and for mentioning “A Child of Eternity”, with which I wasn’t familiar.